If there's a place where Pittsburgh Steelers and Cleveland Browns fans could potentially join hands and sing "Kumbaya," it just might be Buffalo Blues in Shadyside. "It's non-judgmental and inclusive," says Edward Verdream, a Shadyside resident for 10 years. He sat in a pack of Steelers fans who had been there for the Oct. 5 victory over the Jacksonville Jaguars. Over at the bar, a group of Cincinnati Bengals fans waited to see their team take on New England on Sunday Night Football. "We were asking friends that lived here, 'Where we can watch the Bengals?' They said, 'Nowhere, really,'" says Emily van Treeck, a Cincinnati native on a rotation in Pittsburgh for her job. "Then we discovered Buffalo Blues. It's really cool here because people watch other teams." 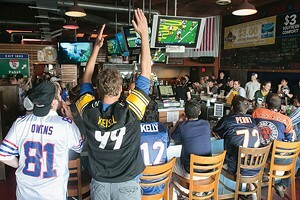 "At any other Pittsburgh bar, you'd probably get cabbage thrown at you for rooting for the Bengals," adds her friend and co-worker Grift Krennbrink, in between sips of his beer and bites of boneless spicy garlic wings. What started as a blues bar in the mid-'90s is now one of the city's most popular sports bars. "We hosted the Jerome Bettis Show one year, and that's what really propelled us as a sports bar," owner Michael DiFiore explains. The name never changed, and neither did the menu. Wings and barbeque have always been the "marquee items," and specials include Wednesday's all-you-can-eat wings. Buffalo Blues also has 32 beers on tap and nearly a hundred more in bottles. But back in the old days, the place had only 16 TVs. There are now more than 30. "Because we're here in Shadyside and we're close to universities and hospitals, we've become the place people come to on Sundays to watch their teams," Difiore says. "We make sure that every game is on. You can be an Oakland Raiders fan, and you can come to Buffalo Blues." Rivalries heighten during college-football games on Saturdays, though. "When big games happen involving Penn State, Ohio State or Notre Dame, we'll section them off and it's kind of a constant cheering battle," bartender Matt Jackson says. Not too far from the bartender sat Kelly Watkins, a San Francisco native garbed in 49ers gear who now lives in Squirrel Hill. With a close game — Kansas City 17, San Francisco 22 — she waited until a commercial to talk. "My team is playing here, and I was here last week to watch them, too," Watkins says. "Plus they have a really good veggie burger, and I appreciate that." Over in a corner booth, a group of guys in both Steelers and Eagles garb sat together. "At least I get one TV for my Eagles game," says Rafiq Payne, a Philly native living in Stanton Heights. "Burn that," a friend quietly mumbled about Payne's green jersey. Even in a place where all fans are welcome, sports rivalries live on.